Core and slice 6 medium apples (do not need to peel unless you prefer) in pan of salt water to prevent apples from turning dark. Drain and rinse. Melt 3 Tbsp butter in a heavy skillet with a close fitting lid. Pour apples into melted butter. Add ½ cup sugar. Cover and cook very slowly until apples are tender, stirring only occasionally. Remove lid and cook down until thick syrup remains. Wash, core and thinly slice apples into a large dishpan of water that has ½ cup of salt added. The salt will prevent the apples from turning dark. Drain off water and rinse before cooking. Cook apples in small amount of water over low heat until soft. Press through sieve. Measure 16 cups thick applesauce, 1 cup vinegar, 8 cups sugar, 3 Tbsp. Cinnamon, 1 Tbsp. Cloves, 1 ½ tsp. Nutmeg, 1 ½ tsp. Allspice into a large pot. Combine all above ingredients in large pot. Cook on low heat until mixture is thickened. During cooking, stir often to prevent sticking. Cook until desired thickness. 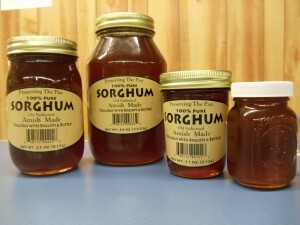 Pour into hot sterilized jars and seal. 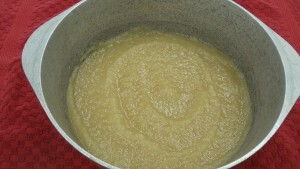 Measure applesauce into a pot and add ½ cup sugar for each cup of sauce. Reheat to boiling on low heat, stirring often to prevent sticking. To can – pour into hot jar’s, adjust lids, process pints 20 minutes in boiling water bath. To freeze – cool and pack in containers to within ¾ of top, seal, label, date and freeze.